Bringing a fresh dose of West Indies charm to the Gulf of Thailand, poolside bar CoCoRum at the Four Seasons Resort Koh Samui has recently unveiled its glass-fronted Rum Vault facing the property’s private beach. Here, a sturdy, paint-flecked wooden door opens into a space that holds more than a hundred coveted sugarcane spirits donated by Four Seasons guests from around the world. 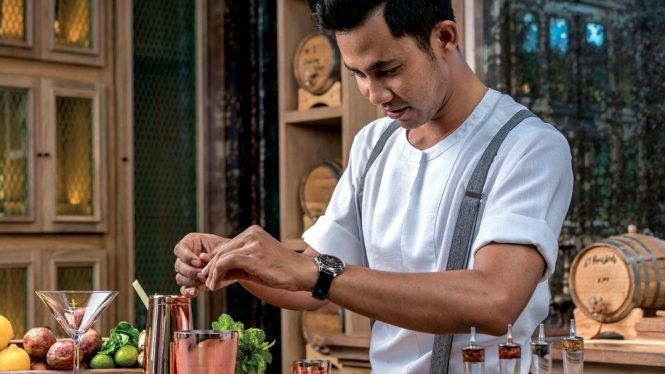 Tasting sessions allow patrons to sample a selection of four rare, limited-edition rums, while the bar’s own experimental flair is on display in the resort villas, which now come stocked with rum-based cocktails that have been aged and bottled at the Vault. The first of these has been named El Presidente, which features a heady blend of Venezuelan Diplomatico Mantuano rum and Mancino Rosso vermouth prepared with a splash of Joseph Cartron triple sec and grenadine. This article originally appeared in the February/March 2018 print issue of DestinAsian magazine (“Rum and Reason”).